Beachfront resort hotel accommodation near Waikiki Beach Oahu near Honolulu, the centre of happy-go-lucky Hawaiian beach life, suits all tourist budgets. These beachfront hotels, while near the Honolulu CBD are in a very different environment so when booking a holiday hotel near Waikiki Beach, know that there are many islands in the Hawaiian chain, Ohau being one island and that Waikiki Beach is one of many beautiful beaches on the island of Oahu. 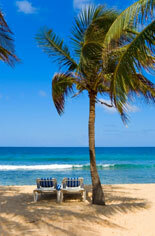 If you want to book accommodation near huge surf try the north shore of Oahu. 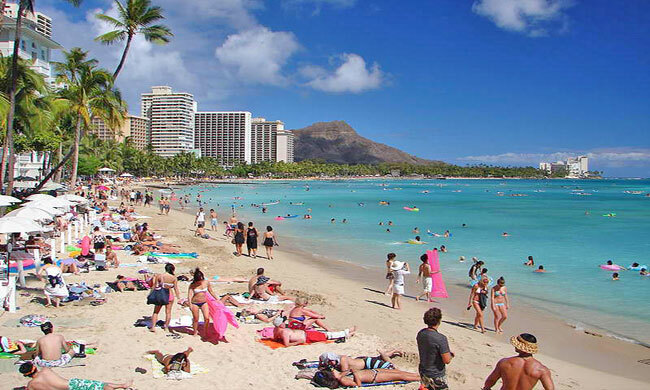 Waikiki Beach is featured in dozens of movies and TV shows, with Diamond Head to the left and the famous pink palace, the Royal Hawaiian Hotel, to your right. Straight out in front is Hawaii's famous gentle surf, thrilling visitors catching easy waves back in to Waikiki Beach, the same scene for a hundred years near Waikiki Beach. Waikiki Beach is a vibrant, happening beachfront dotted with 5 star luxury hotels, and plenty of other accommodation near the white sandy beach all the way back till you reach the Ala Wai canal. Waikiki Beach climate is warm tropical all year round, just perfect for whenever you want to take a break from your busy life. 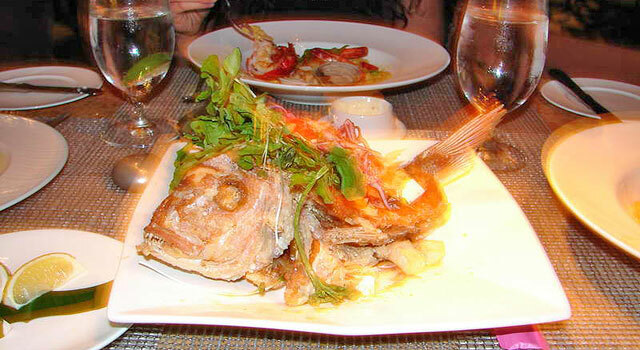 This is a special place because of the relaxed beach atmosphere and the spirit of "Aloha", which is the local greeting. Aloha means "with love", and Hawaiian culture delivers this spirit of hospitality. The spirit of aloha is exemplified best at "The Royal Hawaiian Hotel", the famous five star Luxury Collection hotel that is the classiest of the Starwood hotels near Waikiki Beach. The pink hotel near Waikiki Beach, world-famous landmark, was once the summer home of the King and Queen of Hawaii. King Kalakaua's palace is still located in downtown Honolulu and is well worth the $10 entry to see how the Hawaiian royals once lived. Head straight to the world’s best beach and take in the wonders of Waikiki Beach. Try Duke’s Bar near the beach from late afternoon as locals and tourists alike gather for a drink as the sun goes down over the Pacific Ocean. Duke's was named after the man known as the Father of World Surfing, Duke Kahanamoku, who's a Hawaiian legend. He was one of the world's first big wave surfers as well as an Olympic Gold Medallist in swimming over a number of Olympic Games. In 1914 he came to Australia with a surfboard carved from a single log. This was Australia's first introduction to surfing. You'll find statues and plaques dedicated to the Duke along the sidewalk near Waikiki Beach. For shopping, some of America's best retail therapy is at the "Waikele Outlet Mall" half an hour north of Waikiki Beach. Famous brands here include Barneys New York, Calvin Klein, MaxMara, Polo Ralph Lauren and Bebe at discount prices, made even lower by Hawaii's state tax which is only 4%. A good tip is to start your shopping at "DFS Galleria" duty free stores on "Kalakaua Avenue", then take the $5 shuttle direct to Waikele's outlets. Along the way you'll pass the "Ala Moana shopping centre", which is the world's largest open air shopping mall with good bargains. In Waikiki itself, it's worth a visit to the "International Market" to meet local traders as you wander down "Kalakaua Avenue". taking in all the sights on the street. Near the northern end of Waikiki Beach, is a magnificent 21st century shopping strip on "Lewers Street" called the "Waikiki Beach Walk". 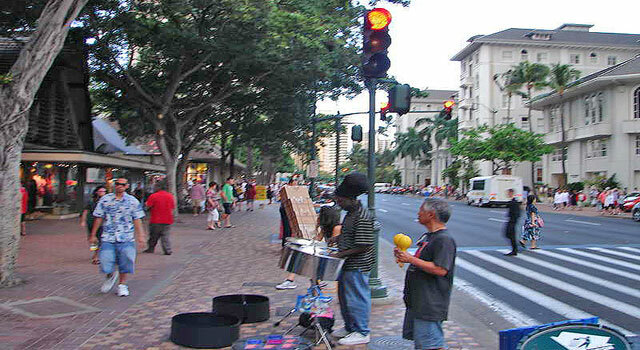 It's just past the "Royal Hawaiian Hotel" and features a multitude of shops and cafes both upstairs and downstairs. A must thing to do is sightseeing this beautiful Hawaiian island of Oahu, especially the famous North Shore beaches of "Waimea Bay" and "Sunset Beach". The huge waves that draw the world’s best surfers pump through in December and January, but other times of the year you’re likely to be greeted by still waters and an idle lifeguard in his hut who’ll be happy to take your photo. The nearby Waimea Bay national park is also a beautiful natural experience on a beautiful laidback island that to this day has a touch of magic in the air. Take seven day cruises from the capital Honolulu near Waikiki beach, on the "Pride of America" cruise ship or the "Pride of Aloha" to the other beautiful Hawaiian slands including Maui and its Kaanapali beach, as well as the pristine beaches of Kauai and the "Big Island" of Hawaii. 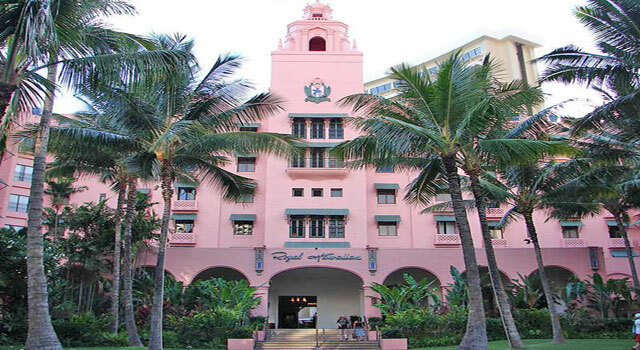 If you want opulence right in the middle of the beach strip, stay at the "Royal Hawaiian" resort hotel. The Royal Hawaiian's hotel rooms are gracious and many have balconies looking straight down onto the beach sand and palm trees below. 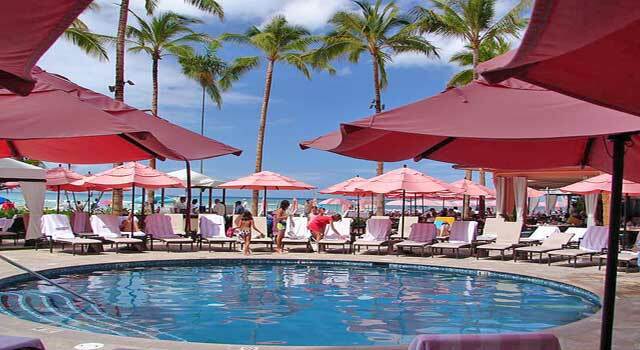 The Royal Hawaiian beachfront resort hotel is the best value-for-money hotel on Waikiki Beach because of its sheer class at affordable prices. You know you're in for a good vacation when you arrive at the Royal Hawaiian's vibrant pink mission-style façade with its contrasting brilliant deep blue signage. The pink pots on top of this stunning landmark overlook lush gardens that are a private oasis for guests, shutting out the hustle and bustle of Waikiki beach. If you want to be pampered, this is the place. The Royal Hawaiian resort hotel has a wonderful private beachfront with a secure private section that's like the dress circle for undressed guests who just want to laze on sunbeds in their bathers. The buffet breakfast is just behind the sunbeds on the beach, so it's just a lazy few steps after breakfast to your prized position observing beach life passing by and in the Pacific Ocean. The Royal Hawaiian hotel staff including general manager "Kelly Hoen" exude that serene spirit of aloha that is so unique in Hawaii. Hotel staff are perfectly suited to this sacred hotel site that honours the spirit of the Hawaiian Royal Family who used to walk these grounds. 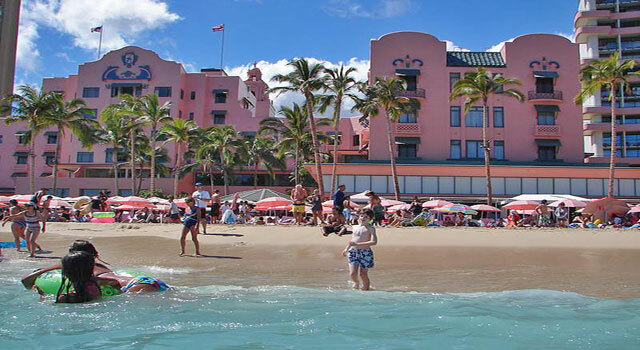 The Royal Hawaiian beachfront hotel has been awarded the 2010 Travelers' Choice award for Romance and Relaxation. The walk down the stylishly decorated hallway towards the bright strip of white sand and blue ocean in front of you is unforgettable. Everywhere you go along Waikiki Beach, your eyes are drawn to this Pink Palace that's so alluring. Book The Royal Hawaiian Online. Just down the beach, High Tea at the Royal Hawaiian's sister beachfront hotel, the "Moana Surfrider" is a memorable experience, with all types of fruit tea and delicious canapes to enjoy while looking out at beautiful Waikiki beach. The famous Banyan tree under which "Robert Louis Stevenson" wrote is the centrepiece of the Moana Surfrider's view of Waikiki Beach. The author befriended the King's niece "Princess Kaiulani" in the late 1800s and spent a lot of time on the current Moana Surfrider hotel site. Directly across Kalakaua Avenue and near the Moana Surfrider hotel is the Moana Surfrider's sister hotel, the Sheraton Princess Kaiulani hotel. The Sheraton Princess Kaiulani is a good family hotel near Waikiki Beach with reasonable rates, a nice pool for adults and children, and Pacific Ocean views from the higher floors. Try the hotel’s local entertainment at night while sitting outdoors enjoying the reasonably-priced buffet restaurant near the candle-lit pool. 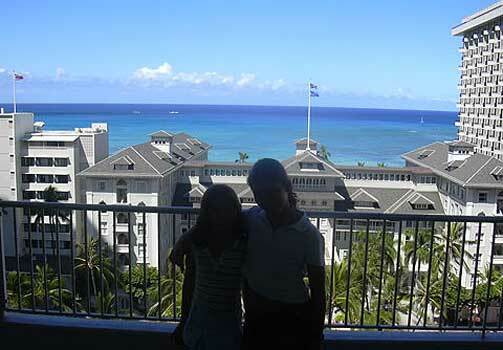 The hotel stands on the site of the Hawaiian Royal family’s property where the famous young Princess Kaiulani grew up. On January 17 1893, a group of mainly American businessmen backed by American troops forcefully overthrew the Hawaiian royal family. Princess Kaiulani travelled the world trying to get support for Hawaii's independence, but met a tragic death. On her return, she was caught while horseback riding in a heavy downpour, and died from pneumonia. Princess Kaiulani's magic but tragic life is commemorated to this day with the many portraits and images of the young princess in the foyer and halls of the "Princess Kaiulani Hotel". There is plenty of hotel accommodation in Waikiki Beach Hawaii that stretch all the way back to the Ala Wai canal. Cheap budget hotels, backpacker accommodation, hostels, B&Bs etc. Waikiki Beach is the world's best beach because of that unique combination of pretty palm-fringed beach with plenty of hotels and bars that range from sophisticated to beachy. 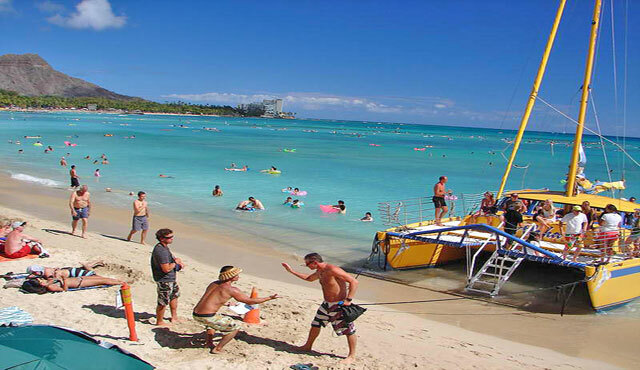 Just to arrive at Waikiki beach and walk onto that famous strip of sand is one of life's memorable experiences. You've seen it in travel stories and on television, and when you experience it yourself it's very, very pleasurable. 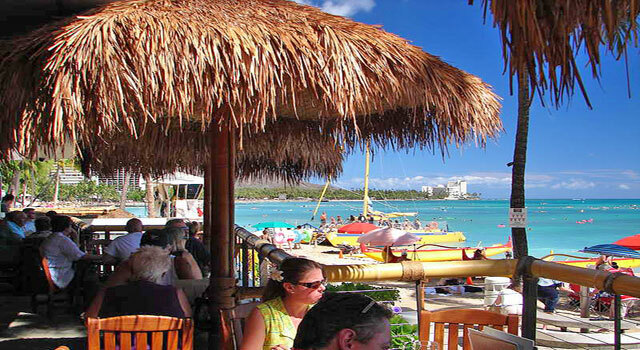 If you want a best beach holiday that has it all, Waikiki Beach Hawaii is hard to beat. Best beach holiday travel destinations Hawaii are written by dedicated photo journalists, published and edited by the Best Beach Holidays Travel writer. Contact Best Beach Holidays to submit your beach holiday articles.